Best Fantasy and Science Fiction: Read an E-Book Week Begins! 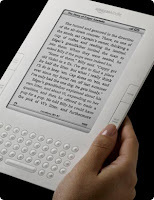 If you did not already know, March 8th-14th is "Read an E-Book Week"! Save a tree or two, cleanse your hands of their blood (It's just sap but you get the point) and enjoy this guilt free week! Visit the official website of Read an E-Book Week and find numerous resources and partners that are allowing you to read their books for free! One of which is Random House who recently released their Free Fantasy and Science Fiction Library, Suduvu, on March 4th 2009. The Suduvu Free Book Library currently features work from Naomi Novik, Robin Hobb, Harry Turtledove, Kim Stanley Robinson and T.A. Pratt. From each author a series is chosen, and the first book of that series is completely free to download and read! This is a clever marketing strategy on their part, but in the end we all win! I have already begun reading "Blood Engines" by T.A. Pratt and would have never picked up this book if it hadn't been for this promotion. This is a great opportunity to expand your literary horizons. You may have seen my posts on the Kindle 2 so you know I'm with you here. I'm really enjoying reading an ebook right now. And I've got several more lined up right behind that one.